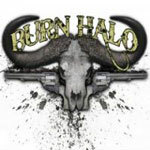 If Burn Halo hasn't showed up on your American rock radar, then be prepared because they will. I've got a feeling this band formed around ex-18 Visions frontman James Hart may become as ubiquitous as their peers Nickleback or Hinder. Burn Halo is essentially more of that popish modern melodic hard rock which the American music industry craves (and knows will make them a sh*tload of money). After the demise of 18 Visions, Hart hooked up with The Nixons' Zac Maloy and began writing for this debut piece. 'After nearly nine months of writing the record with Maloy and working with Daniel Adair of Nickleback, Chris Chaney of Jane's Addiction, Neal Tiemann, Keith Barney and Synyster Gates of Avenged Sevenfold, they had a full-length debut record. The album was due to be released in 2008 through Island Records, but when the band was finished with the album, Island elected not to release it, leaving the band with a finished album, and no label to release it on. So, Burn Halo's manager started his own label, Rawkhead Rekords, and distributed the record through Warner Music Group.' [Source: Wikipedia] Burn Halo released 'Dirty Little Girl' as a single in November 2008, and this was also picked up for a WWE video game (now there's a credible medium to propagate your music). The substance of Burn Halo is basically defined by two things: current American rock music trends and the original personal involved in the recording. The whole album reeks of pure radio-friendly modern hard rock; it's heavy enough to be rock and catchy and clever enough to bring the boys and attract the girls to a stadium near you. If you think you hear Nickleback, then you're not far from the truth. Songs like 'Dead End Roads & Lost Highways' or 'Our House' are deadringers and could have easily been on heir last album. Yet both are very good songs. To Hart and Maloy's credit there is some (if only a little) inspired stuff on this debut. For instance, 'Here With Me' reminds of the glory days of GNR with its melodic arrangement and Slash-like guitar phrasing. 'So Addicted' dumps the radio-friendly formula for a more intriguing arrangement of post grunge modern rock. The single thing that attracted me to Burn Halo was the knowledge that A7X's Synyster Gates would be lending his guitar talents. His work on 'Anejo,' though average for his skills, saves this mediocre song. But on 'Dirty Little Girl' you would never know he was in the studio, and that's just a damn shame. Burn Halo's modern melodic hard rock fits well with the current mainstream, and so will probably be most successful. It has all the quality of nifty, poplike, and polished melodic hard rock that radio stations find friendly and fills arenas lining promoters pockets. For jaded reviewers and rockers like myself, I'll have to deny Burn Halo as a guilty pleasure (like the latest Nickleback album). Geez, did I just really say that!